Somewhat overlooked, an impressive Art Deco structure serves as the visual anchor to the southern edge of Dealey Plaza and the western edge of downtown Dallas. Generally off-limits to the public, the historic Terminal Annex Building once served as an important postal facility for the city. Today we explore its history and the notable Depression-era murals that still decorate the structure. The U.S. Post Office and Courthourse at Bryan and Ervay Streets was the talk of the town when it opened (after much delay) in 1930. 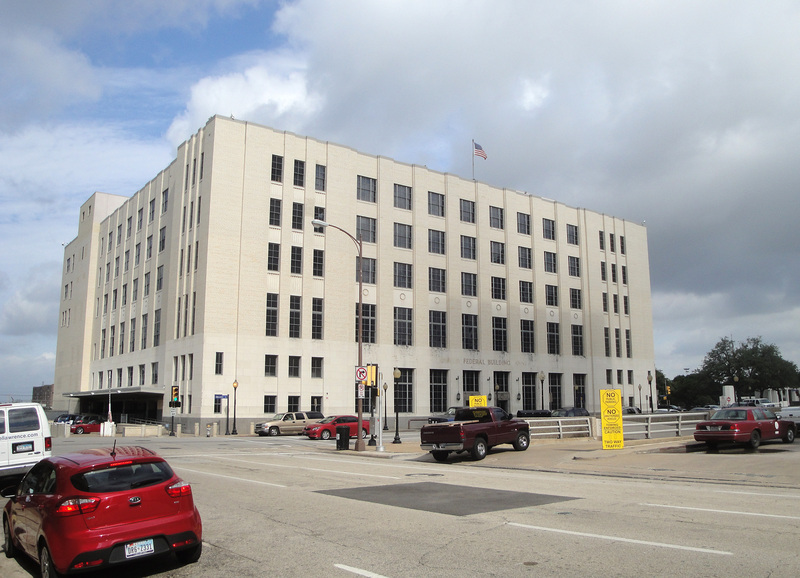 The new building — featuring a limestone facade and dramatic interior — served as the impressive home to a myriad of federal agencies and the main downtown postal facility. But while the Postmaster and his staff occupied the new building, major postal sorting operations remained off-site in a separate facility along Young Street. This warehouse — leased by the federal government — was both a costly and inefficient operation as the city’s population and overall demand for mail increased. In 1931 funds were appropriated for a permanent parcel post substation convenient to Union Station and capable of processing mail for the entire region. A site was chosen in 1933 next to Dealey Plaza — a new gateway into downtown also under construction. The site, on the Southwest corner of the town square, was always an important piece of land in Dallas. 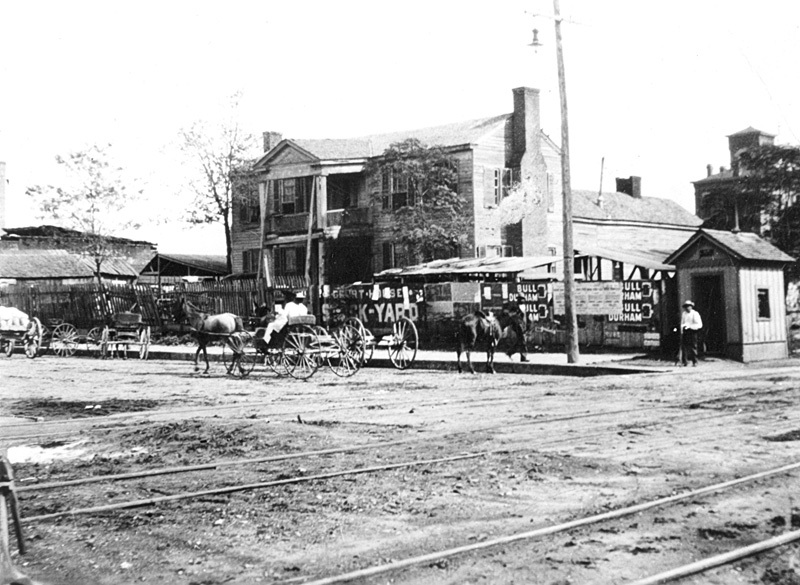 Located adjacent to the eastern approach of the Commerce Street Bridge (the major Trinity River crossing into downtown), Alexander Cockrell purchased the land from city founder John Neely Bryan and moved his 1850s house to the site. Close to the center of the growing city, the Cockrell homestead became an important base for Confederate guerrilla leader William Quantrill and his men during the Civil War years; important dances and celebrations were often held in the eight-room home. Unfortunately, the flood of 1908 sealed the home’s fate and it was demolished shortly after. In later years the block housed a number of businesses including a wagonyard, saloon, hotel, seed store and early postal substation. The relocation of the Trinity River allowed for the removal of the Commerce Street bridge; the construction of Dealey Plaza erased many pioneer structures as new businesses relocated to the east end of downtown. Lang & Witchell, one of the most prominent architectural firms in twentieth century Dallas, was chosen to design the city’s fifth new postal facility. The $1,000,000 building opened in August 1937 as the most modern mail-processing center in the country. Originally planned as a two-story structure, it opened with three floors with plans for additions as needed (at one time, a 500-person federal prison was proposed to sit on top of the building). In 1939, funds for two additional floors were appropriated and the building rose even higher. The Annex featured a small public lobby on the ground floor and became a popular drop-off point for outgoing mail. In addition to lobby service windows, a row of curb-side postal bins allowed for auto service; at one time traffic was so great that a postman stood on the curb with a bag for mail collection. As in other postal facilities, the lobby also included individual post boxes; one of these was rented for a time by Lee Harvey Oswald. Ironically, the Annex would play an important part during the events surrounding the Kennedy Assassination. According to the Warren Commission, Postmaster Harry D Holmes — a key witness in the investigation — witnessed event in Dealey Plaza through binoculars from his fifth floor office. As with other Federal buildings in Dallas, demand soon outpaced available facilities… even with additional floors added to the Terminal Annex. A renovation of the Annex allowed the building to handle both incoming and outgoing mail, and the necessity of the old post office on Ervay Street began to wane. Plans to construct a new federal building directly east of the Annex (today’s site of the George L. Allen Sr. Courts Building) would have allowed for expansion of the existing facililty, but the new federal facility was instead located several blocks east. In June 1978 shipment of mail by rail had greatly decreased, and all postal operations were moved to a new, state-of-the-art facility in Oak Cliff. 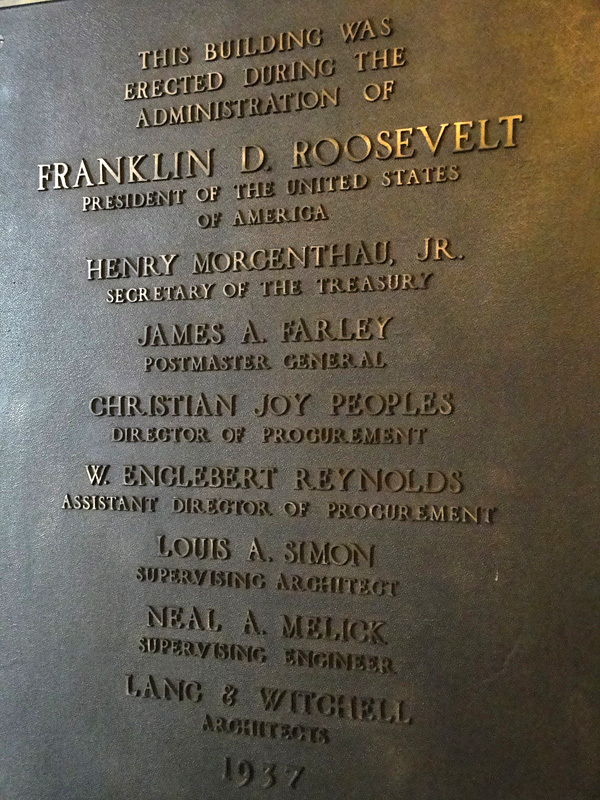 The General Services Administration took ownership of the facility (now known as the Federal Building Annex), and since that time the building has housed various military and federal agencies. 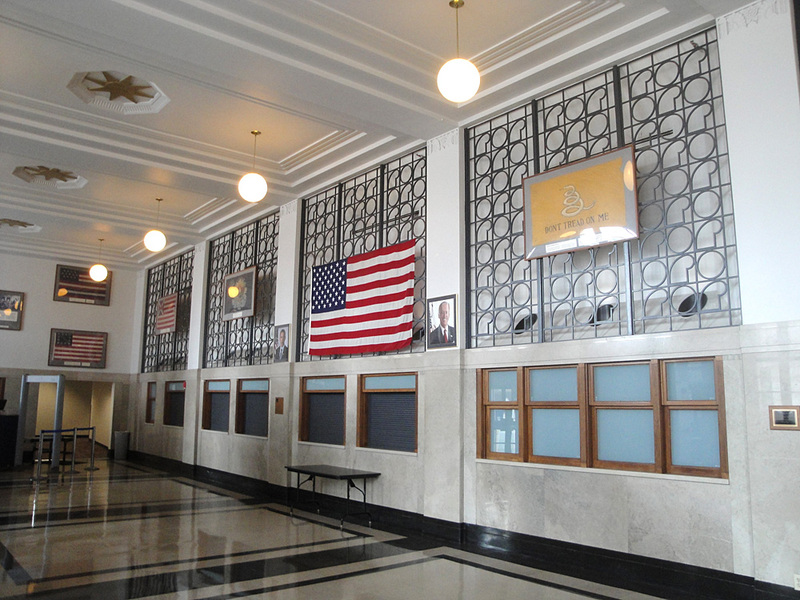 The Terminal Annex was decorated in an Art Deco motif stressing vertical lines and stylized symbols; the interior lobby retains decorative column capitals and star-shaped ceiling reliefs. However, the lobby’s greatest decorative features are two murals painted by New Mexico artist Peter Hurd. In the middle of the Great Depression various programs were established to fund public art, creating jobs for artists and optimism for people facing hardship. Throughout the United States, post offices built during the 1930s were decorated with images reflecting local interest, history and industry (social realism portraying images of bread lines was discouraged). Providing decoration in public buildings made art accessible and available to the population in every community. Sponsored by Roosevelt’s New Deal, murals placed in these buildings were executed by artists working for the Section of Fine Arts administered by the Procurement Division of the Treasury Department. 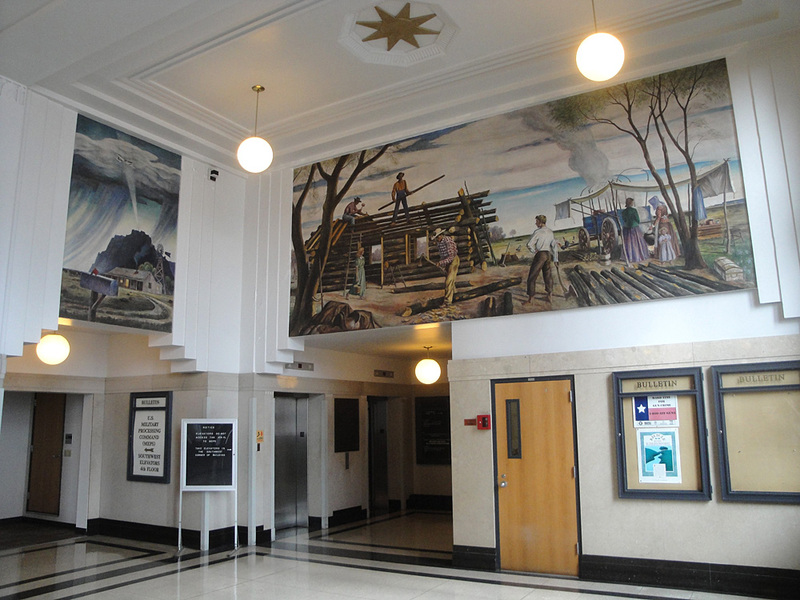 Between 1934 and 1943, more than 60 post offices in Texas were decorated with nearly 100 murals. Soon after the Terminal Annex was completed, three murals were commissioned and a national design competition was held. From an entry field of 149 applicants regionalist painter Peter Hurd — who rose to national fame in the 1930s — won the anonymous competition (the winning designs were displayed with all other entries at the Dallas Museum of Fine Arts in 1949). Hurd was paid $7,200 for the murals and completed them over an 18 month period beginning in 1940. The smallest of the murals was executed first, and a larger wall was painted a year later when building alterations were complete. “Airmail Over Texas” filled the smaller space while “Pioneer Homebuilders” filled a large wall at the north end of the lobby. “East Bound Mail” — a third smaller mural — was never executed due to the termination of the Section of Fine Arts in 1943, before the lobby’s south expansion (and a place for the mural) was complete. During the process, requests were made to include the reconstructed John Neely Bryan cabin in the mural (since it represented the city’s first post office). Hurd objected, believing his paintings should live in the present and not take scenes from reproduced history. Instead, he focused on history of southwestern life and scenes that could still be seen in areas of the southwest at the time. 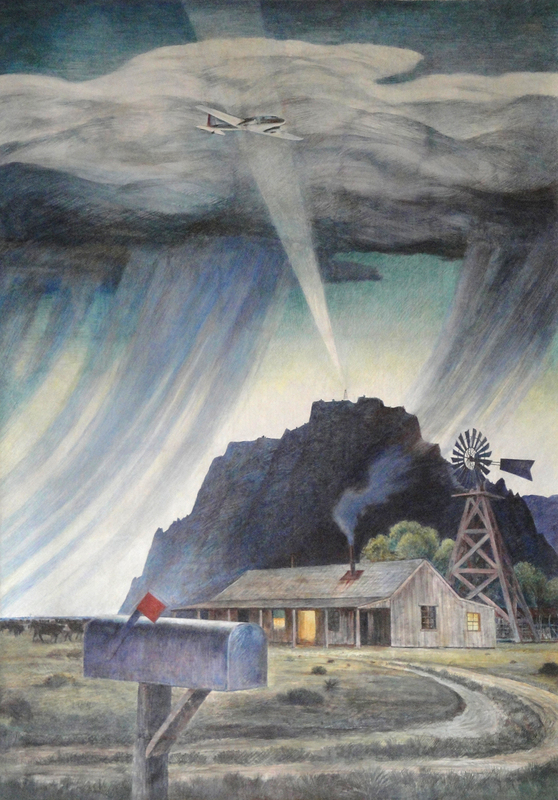 “Airmail Over Texas” featured a West Texas ranch with a plane overhead (showcasing the advancement of night airmail delivery), and the other mural referenced scenes from the North Texas prairie. The murals remain in good condition and have been restored in recent years; residing in their original location they provide a colorful addition to the space even as the function of the building has changed. While many post office murals have vanished over the years, surviving artwork gives us a glimpse of the American public’s taste during an interesting time in our nation’s history. With a renewed local interest in depression-era murals many of these paintings have been restored and proudly displayed. Peter Hurd’s murals in the Terminal Annex remain an important cultural contribution to the historic fabric of downtown Dallas. Note: The building has limited access to the public and photography of the federal facility is generally prohibited. Special permission from the U.S. General Services Administration was obtained for the images shown here. 8 Responses to "Terminal Annex and its WPA Murals"
If you tell the guard that you just want to see the murals, they’ll let you in for a couple of minutes. The murals are very easy to see. Yes, it’s very easy to see the murals from the building entrance. I’m glad they are still visible to the public and not hidden in other areas of the building. I have GOT TO GET INSIDE and see these! My dad spent the majority of his 33 years with the Dallas post office at the terminal. He had many fond memories of the building. Love the picture of the night airmail. Some might be interested to know that before ground-based radio navigation aids (and certainly long before global positioning systems), the country was criss-crossed with a complex system of light beacons, just as depicted in the mural. Using a chart, pilots would navigate at night visually flying from beacon to beacon. They could fix their position over the ground by referencing particular beacons that flashed in a unique way and/or displayed different colors, much like maritime navigation aids (lighthouses, etc.) do still.